Welcome to the GRE practice test page. The links below will help you take our GRE sample test. These GRE practice questions will give you a better idea of what to study on your exam. If you need additional practice questions get our GRE study guide and flashcards. Upgrade to our best GRE study guide and flashcards resource. What is a GRE test for? The GRE test is used for those who want to enter into graduate school. The GRE is an admissions exam that is used by many graduate schools. What does the GRE test consist of? The GRE exam consists of three sections: Analytical Writing, Verbal Reasoning, and Quantitative Reasoning. The Analytical Writing section is an essay section that measures how well you can articulate your thoughts and responses to complex ideas. The Verbal Reasoning section consists of two sections that both contain 20 questions each. The Quantitative Reasoning section also contains two separate sections with 20 questions each and you are given 35 minutes to complete each section. Is the GRE test difficult? As with any exam, the difficulty of the exam greatly depends on you, how well you have prepared for the exam as well as which areas of the exam you are strongest in. One section of the GRE exam may be difficult for you while another may not be as difficult. What is considered a good score on the GRE? The Verbal Reasoning and Quantitative Reasoning sections of the GRE are scored on a scale from 130 to 170 with the average scores being 151 and 153. The Analytical Writing section is scored on half-point increments from 0 to 6 with the average score being 4.0. However, a good score on the GRE determines which graduate school or business school you want to attend. What is a perfect score on a GRE? There are two sections on the GRE that are scored on a scale of 130 to 170; the Verbal Reasoning and Quantitative Reasoning sections. The highest score that you can make on these two sections is 170. The Analytical Writing section is scored from 0 to 6, which makes 6 the highest score possible. To register to take the GRE exam, you are required to pay a fee of $205. How many times can you take the GRE? If you fail the GRE the first time, or decide to retake the exam to improve your chances of getting a higher score, you can take the GRE every 21 days and you can do that up to five times during any continuous 365 day period. Can you fail a GRE test? You cannot “pass” or “fail” the GRE exam. It is your decision if you want to send the score that you have received to the schools of your choice. Each school has a different cutoff regarding “passing” or “failing”. What is the GRE score required for Harvard University? The required score for the GRE to attend Harvard University varies depending on which program you want to enter. For example, you would need to have a higher Quantitative Reasoning score for a computer science program than what you would need for a design program. The time it takes to prepare for the GRE is a personal preference. Most people spend one to three months studying for just a few hours a week while others might study 10 or more hours each week. Anyone who is planning to attend graduate or business school is usually required to take the GRE exam. How long is a gre good for? Your GRE scores are valid and kept on file for five years following the date that you took your test. Can you use a calculator on the GRE? You can use a calculator on the quantitative questions of GRE exam. However, you cannot bring your own. There will be an on-screen calculator that will be provided. How do I get a GRE fee waiver? To apply for a fee waiver for the GRE, you must first contact the financial aid office of your school to see if you qualify to receive the waiver. If the office finds that you qualify for the fee waiver, the financial aid office will issue you a Fee Reduction Certificate and a copy of your ISIR. You must follow the instructions located on the certificate in order to receive it. Is the GRE easier than the GMAT? The level of difficulty between the GRE and GMAT exams depends on the student. There are significant differences between the two exams which may make one harder than the other. Is it best to answer all questions on the GRE? You are not penalized for having an incorrect answer on the GRE exam. Incorrect answers count the same as an answer being left blank, so it is always better to guess the answer rather than skipping. The GRE test is timed and takes about 3 hours and 45 minutes to complete the exam. The Analytical Writing section and the Verbal Reasoning sections each consist of two sections that are each timed for 30 minutes. The Quantitative Reasoning section also contains two sections but each section is timed for 35 minutes. What business schools accept the GRE? There are many business schools that accept the GRE. A few of these schools include Harvard Business School, Duke University, and Yale School of Management. If you’re interested in attending a specific school, it would be best for you to contact the school to see if they accept the GRE exam. If your goal is to continue your education at the graduate level, you will most likely need to take the GRE. An impressive score on the GRE will have a great impact on your future; therefore, you will want to be adequately prepared. What is the most effective way to prepare? Using a variety of study materials and verifying your readiness for the test by taking GRE practice tests is a good approach. The links above provide access to free resources from Mometrix Academy to assist you in this endeavor. The practice test study guides cover all the subjects included on the GRE: Analytical Writing, Quantitative Reasoning (math), and Verbal Reasoning. A free GRE practice test for Quantitative Reasoning and Verbal Reasoning is also available. You can take the GRE practice tests to assess your knowledge and skills and to gauge how prepared you are for the actual GRE test. The GRE example questions will also expose any areas of weakness that need further study. You may want to consider taking a GRE practice exam for the first time and designate next to each question which of the following statements is true. Approaching the practice test in this way will help you determine your areas of strength and weakness. Once you are aware of these strengths and weaknesses, you can wisely concentrate on the areas that need the most work. The questions that you answered correctly won’t require a lot of study; however, you may want to review this material to confirm that you thoroughly understanding why that is the correct answer. The questions that you answered correctly but weren’t sure about need more time and study. Again, you will want to verify that you thoroughly understand the topic of the question. Most of your study time will need to be focused on the questions that you missed and had no idea of which answer was correct. Don’t stress out over these questions! 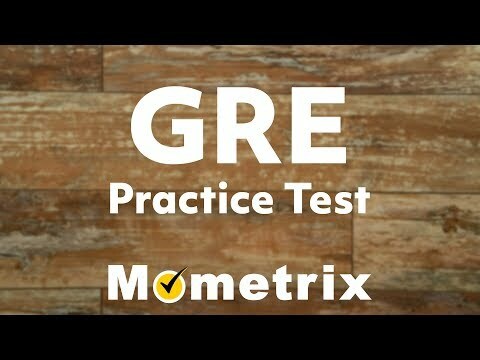 Mometrix has all you need to prepare and score well on the GRE. Using your study materials, take a practice test asking yourself the questions outlined above. Don’t be concerned about how long it takes you this first time. Utilize the Mometrix Academy GRE study materials to gain a better understanding of the concepts you struggled with. The free instructional videos explain all the critical concepts you need to grasp in order to score well on the GRE. Evaluate your new understanding of the material by taking another practice test and using your resources as little as possible. If necessary, review the instructional videos again. Take all other practice tests in a timely manner without any resources, just like it is the real GRE test. Adequate preparation requires repetition and practice. If additional instruction or practice is needed, consider purchasing the Mometrix GRE Flashcards and the Mometrix GRE Study Guide which includes additional instruction, practice tests, and important test taking tips. All Mometrix study materials include a risk-free, 1-year 100% money-back guarantee.